Helping you find your perfect transformational soul-ution to better health and happiness. In the last 15+ years, I've invested thousands of pounds in self development. I've trained in a wide range of holistic therapies and techniques, discovering new passions at almost every turn. The more we learn, the more we realise how little we know. Isn't that so true! I have at each milestone gathered precious jewels of knowledge, polished my skills and embraced my uniqueness to create my own emporium of all those health, healing and happiness treasures that have influenced and changed my mind, my life and, of course, my health. Stepping out of the comfort zone is always a challenge, yet always transformational. I am getting better at it! I can look back and realise how far I've come, while acknowledging I've still a very long way to go. It's exciting. Life has been a rich and varied journey and I am constantly grateful for having been blessed with a open mind that isn't afraid to explore the cutting-edge and revolutionary. Or simply to challenge outdated beliefs once held as true and replace them with ones that open up new doorways of opportunity. This emporium, therefore, is now at the service of others who want to take responsibility for their own health, healing and happiness too. And I can save them hundreds or even thousands of pounds in the process as I've already done so much of the work and am here to share what I've learnt. All they need do it get in touch for a chat and if I feel I can't help you take your next transformative steps, I most certainly will be able to recommend someone who can. Whether it's a wellness wobble, a midset mish-mash, a lack-lustre life or a directional dilemma, your perfect transformational soul-ution is moving closer towards you with every step. I value honesty, integrity, authenticity, trust, ambition, positivity and warmth in life; all those things that have shaped me through life challenges. If these are the amongst your values too, I really look forward to hearing from you. You're exactly the sort of person I love to work with. Wherever you are in the world, and on your unique evolutionary journey, thank you for visiting my website. If you'd like more information on my approach and services, please don't hesitate to get in touch so we can arrange an informal chat either in person, by videoconference, or by email. 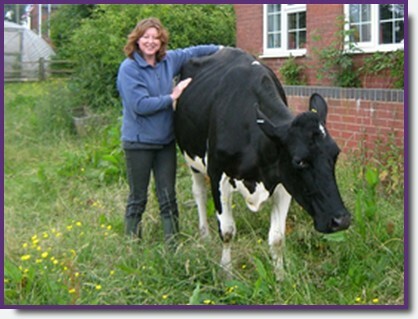 "Energy-work with Lucy the cow on a diary farm in Staffordshire. Have wellies, will travel!"